This year, the Gettysburg Foundation participated in the Big History Project (co-founded by Bill Gates and Dr. David Christian), to bring powerful historical lessons to thousands of middle-school and high-school teachers and their students around the world, from the beginning of time to the present. 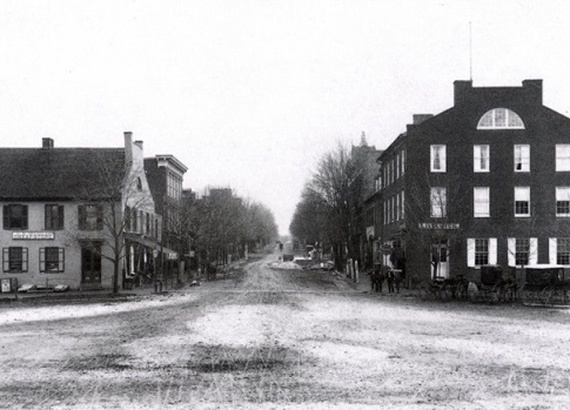 The streets of old Gettysburg. Baltimore Street looking up from the Diamond’ (town square) near the time of the infamous three day battle in July of 1863. Public domain. The Gettysburg Foundation authored a blog for Big History entitled: "Bloodshed @ Gettysburg: Why Does Civility Matter, Anyway?" The blog focuses on the healing that occurred immediately after the 1863 Battle of Gettysburg, as local citizens began to care for the wounded. It outlines a broad pattern of healing that occurred over the next 155 years at Gettysburg, including the creation of a tent hospital called Camp Letterman; Quaker nurses streaming into town to tend to the injured; President Abraham Lincoln delivering the Gettysburg Address; visits by thirteen other presidents of the United States to Gettysburg to speak of conciliation; reunions of Civil War veterans; and the dedication by President Franklin Roosevelt in 1938 of the Eternal Light Peace Memorial that still burns brightly on the grounds of Gettysburg National Military Park.